Dragados, Spain’s leading infrastructure construction company, part of ACS Group, has been contracted to design and construct the expansion of Vancouver container terminal in British Columbia, Canada, informs The Construction Index. The works will be realized at the terminal operated by DP World. 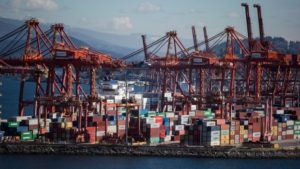 It is located in central Vancouver and is one of the three container facilities in the Vancouver port, accounting for about 20% of the port’s total throughput. The CAD 400 mln (apprx. USD 300 mln) Centerm Expansion Project of the Vancouver Fraser Port Authority involves the expansion and rearrangement of the terminal area with the aim to increase its capacity from the current 900.000 TEU to 1.5 mln TEU per year. Freight movement and access to the harbour area will also be improved, by building a fly-over and by upgrading and refurbishing the access routes. The project aims to tackle the road congestion and improve efficiency by eliminating port traffic from adjacent roads. It will also avoid the three rail crossings used by port users while delivering access to Highway 1. The construction works are anticipated to start in the summer of 2019, dependent on meeting permit conditions, and are scheduled for completion by December 2021. This is the first large-scale port project for Dragados in North America.